Robins are still my favourite Christmas card picture, so here’s another one from Woodlands Farm to accompany my seasons greetings, and best wishes for 2014. 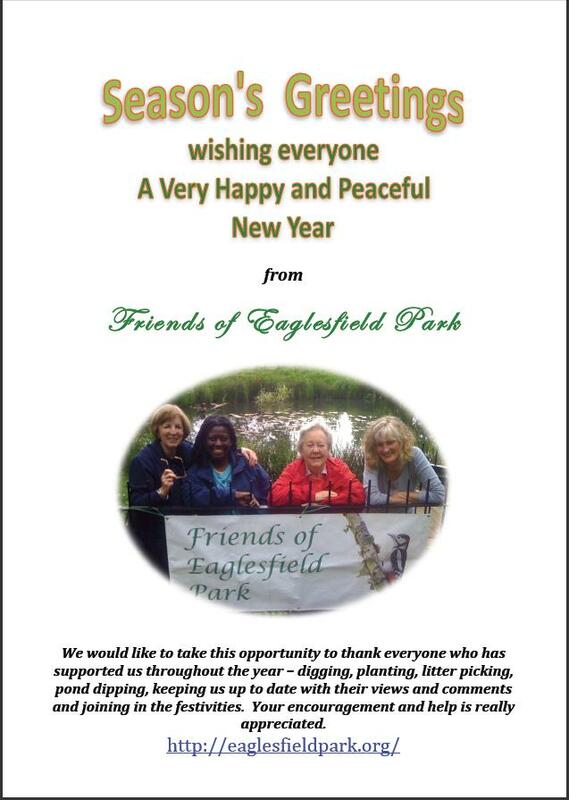 Also Madeleine from the Friends of Eaglesfield Park wrote asking me to thank everyone who has helped with the continued development of the park’s wildlife pond and meadow and to send their Seasonal Greetings. She included an update about the pond and wild flower meadow. This year the wildlife pond and meadow have flourished. Pond life is well established with water boatman, pond skaters, newts, dragonfly, damselfly, snails and many other creatures to be identified. Frogs are certainly enjoying the pond – we discovered dozens of “froglets” hidden in the long grasses during our tidy up sessions. The water lilies offer good cover and shelter for pond creatures and their flowers are attracting various insects. The Pond Dipping Platform is providing a great deal of fun and enjoyment. 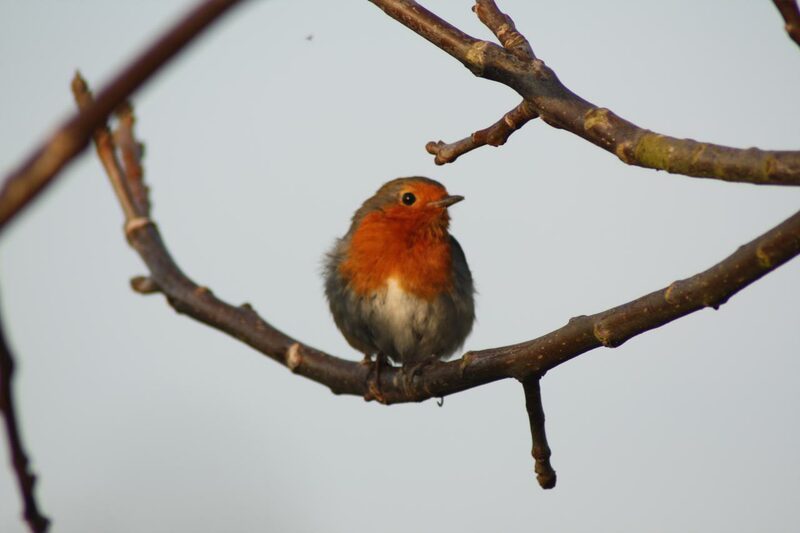 It is wonderful to be able to “get up close” to nature and to hear children asking so many questions (not that we always have the answers – but we do have reference books!). The meadow had quite a different appearance this year, displaying a greater abundance of tall grasses. Grasses are very important for many insects including beetles and bees. Wildflowers are appearing, and we were very pleased to see a strong patch of pink clover and yellow iris at the water edge, which have attracted numerous butterflies. There is still a lot to do, but it is now possible to see distinct features of the meadow habitat as to what is more suited to sunny/dry or shady/dry or, boggy areas around the pond. Very much a “learning curve”! Next spring we will begin the seasonal work again. We are planning to reduce some of the tall grasses and will be planting appropriate wildflower plug plants and sewing more seeds. We will keep you updated. There is no doubt that the Pond Restoration has been worthwhile. We know that our local community value the wildlife pond and meadow and it is very pleasing to see that the wildlife is also now focusing on “the oasis on the hill”. If you have any news or views about Eaglesfield Park, we are always very pleased to hear your comments. Also, do you have any photos of the ark, or pond area you would like to share, I would be pleased to receive them via my email address.